Thames Jet exclusive Gifts now available to purchase securely online. Personalise a gift voucher, add a message, preview and send it instantly by eMail, SMS Text or 1st Class Post. 50 minutes on a ThamesJet Love Rush making your date's heart flutter, gasp with delight and want to hold on tight. Thamesrush - 50 unforgettable minutes as you experience high speed aquabatics. Thamesrush - 50 unforgettable minutes as you experience high speed aquabatics for 2 adults and 2 children. •	Children under the age of 16 years must be accompanied by an adult. 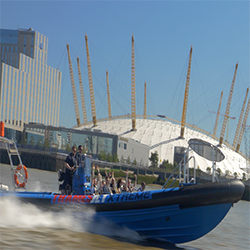 •	For safety reasons, the minimum height requirement to travel on Thamesjet is 1.35 metres (4 ft. 5in.). Get the adrenaline pumping with an exhilarating 50 minute trip on the Thames including sightseeing, speed and aquabatics. Please note, this package excludes all Saturdays. Shaken and stirred along the Thames. Helicopter flights and speedboat rides may shake and stir some a little, but James Bond stays cool when things are moving fast, whether he's in the air, on the water, or in a bar. Shaken and stirred along the Thames. Helicopter flights and speedboat rides may shake and stir some a little, but James Bond stays cool when things are moving fast, whether he's in the air or on the water. ThamesRush - 50 unforgettable minutes as you experience sightseeing and high speed aquabatics for a maximum of 12 people. 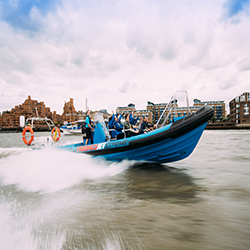 Thamesmax – 75 minutes - the ultimate high speed thrill as you race to the Thames Barrier for a maximum of 12 people. 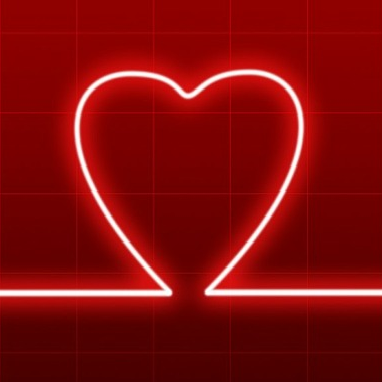 If you have a query or special request please call 020 77 400 400.